We live in the age of plastic, or as some jokingly call it – the plasticene. As a species we produce over 300 million tonnes of plastic every year globally, 5-15 tonnes of which flow into already heavily polluted oceans. Plastics have a far reaching impact on biodiversity, quality of human health and society at large, and numerous economic impacts. Plastic pollution impacts tourism, fishing and shipping, the loss of secondary materials, and perhaps the greatest concern of all – budgeting for cleanup costs. This is a particular issue when considering that the quantity of plastic waste is rising both on land and in our waterways. Because most plastics do not truly degrade but only break down into minuscule microplastic particles, marine debris are a truly dangerous class of pollutants that are extremely difficult to clean up. The Great Pacific Garbage Patch is not, contrary to what some may think upon hearing the name, a large and easily visible continuous patch of ocean litter. Think of it more as a sort of concentrated plastic soup that is held in the place it exists by the clockwise motion of the surface ocean currents. While there are higher concentrations of marine debris that can be found in this area, the vast majority of this floating plastic is invisible to the naked eye. This makes it hard to accurately gage the size of these ‘patches’ or gyres, because the changing ocean currents and winds continuously change the exact size, mass, and placement of the pollution centers. This also makes it hard to discuss cleanup efforts – if the Great Pacific Garbage Patch was simply an island of floating garbage, it would be a lot easier to feasibly be cleaned up. Where we stand now, that is a big and costly problem. 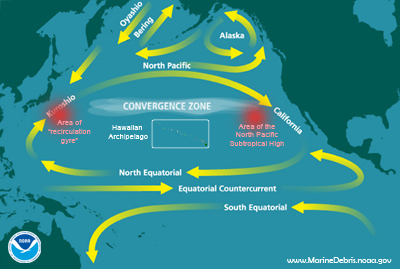 NOAA released a report that attempted to gage the economic costs of a hypothetical cleanup of a 1,000,000 km2 swath of the ocean using boats, which – for the record – accounts for less than 1% of the entire North Pacific Ocean. Using a fleet of boats, each with an 18 ft (5.5 meter) beam which would survey the area within 100m off each side of the ship, it would take 67 boats one year of about 10 hours of work a day (daylight hours) to clean that specific area. With an estimated cost of $5,000 to $20,000 per day, an ocean clean up effort for boat costs alone would cost anywhere from $122 million to $489 – which doesn’t include equipment or labor costs, and completely neglects the vast majority of the marine debris which cannot be mitigated using netting. In 2014 a nonprofit foundation called The Ocean Cleanup launched what would become the most successful non-profit crowdfunding campaign to date, raising $2.2 million from over 38,000 people in more than 160 countries in 100 days. The nonprofit has been using the money in order to fulfill its plans of deploying 100 kilometers of passive floating barriers that would clean up roughly 42% of the Great Pacific Garbage Patch’s plastic pollution in 10 years using wind, waves, and currents that would push floating plastic into screens. As of the project’s latest update on October 23rd the design of their system has been locked in with a prototype up and running in full setup in the North Sea but they are now running into a secondary hurdle with the procurement stage of the system, as negotiating price for particular components can take months – I was personally unable to find any monetary statistics on going prices for components of the project itself. The crowdfunding campaign was a success, but this $2.2 million does not cover the entirety of the project start to finish. For the most part, cleanup of the Great Pacific Garbage Patch is so astronomically expensive that we not only do not have the resources to accurately predict the cost of a successful clean up project, but few agencies are willing to entertain the notion. Both the earlier mentioned NOAA report and several other sources including The Conversation suggested that the ultimate solution to this huge plastic problem is not in clean up and removal, but in preventing plastic from making its way to the ocean in the first place. Deep Sea News suggested storm water debris nets as a way to prevent plastic from ending up in our water to begin with, which would add nets to the outlet of storm drains, but I was unable to find any statistics or feasibility studies performed for the cost of installation, maintenance, and repair of these storm drain nets for any large scale operation which makes the practicality of such a suggestion quite low. I was however able to find pricing information for varied types of singular stormwater capture systems for debris, for which single unit upfront costs range anywhere from $86 to a whopping $250,000 – making this proposal even less likely for large scale implementation at a municipal level. Ultimately, we have two equally important issues to tackle – preventing new plastic waste from entering the pollution stream, and tackling the waste that is already existing in our water. Unfortunately due to the nature of our capitalist economic system, those two issues often end up competing for the same time, attention, and financial funding, which causes most organizations and leaders to choose one over the other. Because the clean-up of these plastic ocean gyres is so astronomically high in price, prevention typically wins out. Having gone zero waste in the past (where I created no plastic or non-recyclable or compostable waste for the duration of five months), I know firsthand how hard it is to avoid plastic use. Yet still, I wonder – if we are able to halt our plastic addictions, would we be able to find the funding necessary to clean up the pollution we have already created?